Sam was born and is based in London, but raised in Paris and Johannesburg. He studied History & Political Science at Trinity College Dublin, where he spent most of his waking hours working in theatre, acting and directing with some of the best young writers working in Ireland today. In 2016, he graduated with a masters in Directing Fiction from the National Film & Television School. 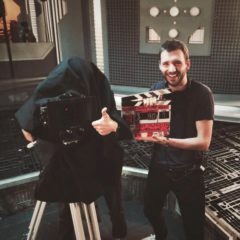 Sam’s short films all focus on examining humans in surreal or fantastical settings, and span genres from science fiction to dystopian western and supernatural drama. Sam currently works as a promo director for BBC News alonside developing several original short and feature projects. His work is defined by a strong visual style and dark sense of humour, while exploring worlds that are new and often unsettling.